If one of the camshaft timing gear bolts is already removed, do not remove any other camshaft timing gear bolts. 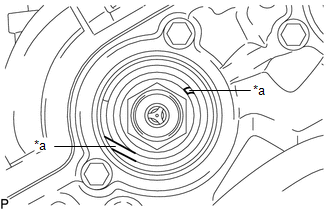 (a) Turn the crankshaft clockwise to align the timing mark (cutout) on the crankshaft pulley assembly with the "0" timing mark on the timing chain cover assembly. 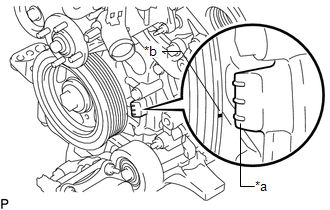 (b) Check that the end of the spring inside of the camshaft timing gear assembly is as shown in the illustration. 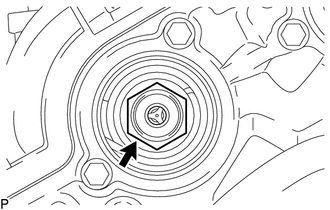 If the end of the spring is not as shown in the illustration, rotate the crankshaft clockwise 360° and align the timing mark again. 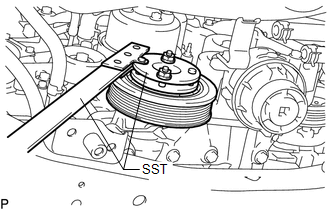 (a) Using SST, hold the crankshaft pulley assembly. (b) Remove the camshaft timing gear bolt. Replace with a new part if it is dropped or if it receives a strong impact.